You can either invite an early learning service yourself, or if your child is already at an early learning service and will soon be moving onto a new one the current service can invite the new service. To invite a new learning service or centre, you have to be an Admin of a child's account. Currently, you would need to log into Storypark via the browser in order to do this. 1. Click the 'Invite' button at the top of the page. 2. In the drop-down box, select the tab at the top that says ‘Early learning service’, and enter the email address provided by your new early learning service, and a short message. 3. 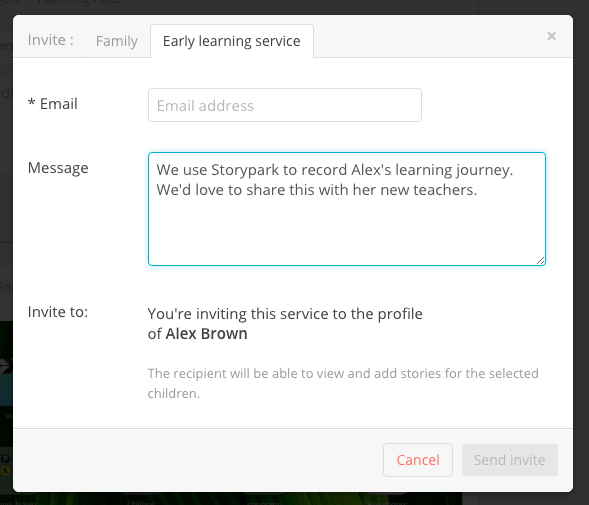 Once your child's new learning service accepts your invitation, they will be able to contribute to your child's Storypark profile. If your child is already at a learning service and will soon be transitioning to a new one, the current service can invite the new service. Before the new service receives their invite, you will be asked by email if you agree to this. If you agree, click the button in the email that says 'Give access' and the new service will be sent an email invitation to Storypark. If this new service accepts the invite and already uses Storypark your child's profile will now be linked to their account and all teachers at the new service will be able to view and contribute to your child's profile. If this new service accepts the invite and doesn't yet have a Storypark account, they will be asked to sign up to Storypark on a free trial. Once they've done this, their new account will be linked to your child's profile and all teachers at the new service will be able to view and contribute to it. If your child leaves a learning service you may wish to remove them from your child's profile so that early learning service no longer has access. Learn more here about what happens when a child leaves an early learning service. Go to your child's profile page. You can find this by going under your Menu and selecting your child. Then select any of the options below that. 2. Click the blue 'Early learning services' link on the right. 3. A drop-down will appear with all the early learning services who have access to your child's account, including any that haven't accepted your invitation yet. 4. Click the red 'x' next to the early learning service's name. 5. Confirm you wish to remove them, and that early learning service will no longer have access to your child's account.